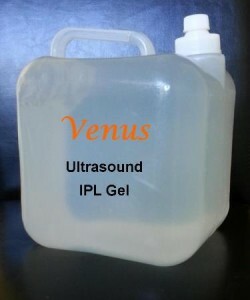 Venus IPL conductivity Gel is water based, thick and clear, manufactured specifically to be used for IPL, RF and slimming treatments. It is available in 5 litre pouches . 1. To cool clients’ skin for a more comfortable treatment. 2. To safeguard client from burns. 5. To safeguard the handpiece crystal from burned particles. If gel is not used then serious damage can occur on the handpiece’s crystal. TOP QUALITY PRODUCT, NOT RUNNY CHEAP STUFF.